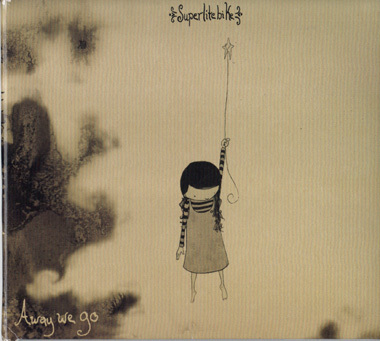 Houston Music Reviews : Superlitebike "Away We Go"
I don't know exactly why but lately I've been getting a lot of the incomprehensible, artsy weird CD submissions out of Austin. It must be that you can't be in a college town and actually have something that resembles "establishment" music. It has to be deconstructionist mush that only moldy philosophy majors that minored in fem studies can get into while drinking their afternoon organic chai lattes. So, I guess, from the previous rant you can expect that I'd find Superlite Bike one of those groups. The answer is a resounding "Yes!". For the most part the feel of this album is an Indian raga slow dirge with some occasional light groove and sparse highlights of melody that break the monotonous drone. The music in itself is avant-garde rooted mostly in rock, around possibly a psychedelic centre, like The Doors, mixed in with some funk, jazz, and ethnic thrown in. What was really interesting is that for the most part these guys were doing exactly the opposite of making something a hit. As soon as it started feeling like it might have a cool hook - they'd change it and flip into something else. It just didn't engage me on a personal level and overall it kinda dragged around drenched in melancholy that hinged on boredom. While the musicianship is competent and the production far from subpar, I can't say that anyone from this band steals the show in terms of chops or performance. I also can't say that the band transcends and creates a greater sum than its parts.